This isn’t typically the sort of book I would naturally pick up on my own, but it’s gotten an awful lot of press and a copy was given to me by a friend (and you should always read the books given to you by a friend). I can understand the interest that this has received but I’m not quite able to say that I enjoyed this book. I came very, VERY close to giving up on this book twice and it was only the fact that it had been so popular that kept me going. It’s pretty difficult to give a brief description of the book without giving too much away. In a nutshell, Amy Dunne – a ‘famous’ personality because a series of children’s books were written with her as the major character – and her husband Nick are about to celebrate their fifth wedding anniversary when Nick discovers Amy is missing and an apparent struggle has taken place inside their home. Nick becomes the prime suspect in Amy’s disappearance but Nick maintains that Amy is alive, and probably well, and setting him up. Why? Well…all is not well in the family life of Nick and Amy Dunne. Author Gillian Flynn sets up a very good story, confusing the reader a bit as we go along with simple suggestions that make us wonder what might be true and what isn’t. The story is broken down into three parts (nearing the end of Part I was one of the times I seriously considered not going on). The first part sets up the characters and the mystery. Part II changes the direction of the story and Part III completely derails it. Flynn plays with the reader, giving us a present narrator that isn’t particularly likable or even believable, simply because he’s not socially adept, and a missing character we get to know only through diary entries and whom we then come to like. But the tables get flipped with the change of direction of the story and who and what we like changes. This is an interesting experience and Flynn manages it quite well, taking us on a real roller-coaster ride. While I often prefer characters that are likable, it’s usually because characters are meant to be likable in some way. Flynn’s characters stand out because they are well-defined and because she very much does not want them to be particularly likable. In this case, it’s the ride that counts. While the format of the story is quite interesting, the mystery was not a surprise to me. Before the end of Part I, I narrowed it down to two possibilities (one of which was correct) and it became more and more obvious what was going to happen. I did not care for the ending and I don’t feel like it was the only real possible ending. It was the obvious ending for a pair of unstable individuals. While Flynn tried to show that she managed to tie up loose ends by having a character give us a quick run-down of how or why potential loose ends were managed, they first of all wouldn’t stand up to any real scrutiny and secondly at least one loose end was never addressed (which could or should be able to change the course of the ending). Looking for a good book? 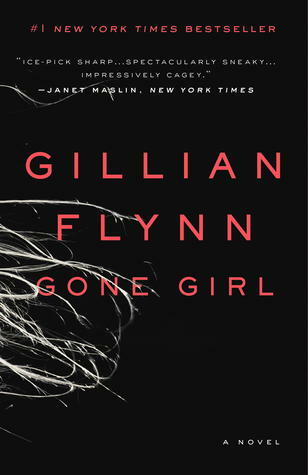 Gone Girl by Gillian Flynn has some wonderful writing but the mystery isn’t as strong as it could have been and form trumps story (though only just slightly).